Even in the Deep South January plantings don’t make the preferred planting window list for winter pastures that will bridge the April to June forage gap. That said, it might be an option when drought or other environmental factors prohibit planting in an earlier, more optimum window. In northern Florida that optimum planting period for cool-season grasses ranges from October 15 to November 15. “Because of an extreme drought in North Florida, unless the producer had irrigation, we experienced forage planting delays this year,” says Jose Dubeux in a recent issue of the extension’s Panhandle Ag-eNews. Dubeux, a forage extension specialist at the North Florida Research and Education Center in Marianna, received many questions about viability of planting late or just buying and feeding hay. Given the dearth of research on unconventional planting dates, Florida researchers initiated a trial to evaluate how cool-season forages would perform to help fill the spring feed gap if planted in January and February. 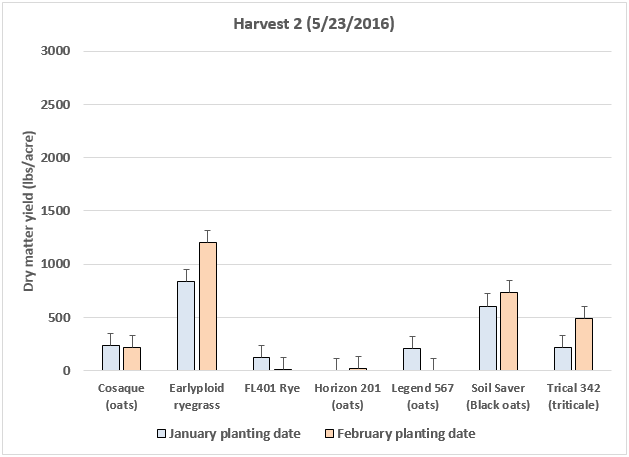 Different cool-season grasses were planted on January 19 and February 18, 2016. Species and varieties planted included annual ryegrass (Earlyplod), cereal rye (FL401), oats (Cosaque, Legend 567, and Horizon 201), triticale (Trical 342), and black oats (Soil Saver). The field plots were harvested on April 18 and May 5. In 2016, planting in January was better than planting in February for all of the forage species. At the April harvest, the cereal grains (oats, rye, and triticale) had higher yields than the ryegrass. Rust infections hurt the Cosaque and Horizon 201 oats. 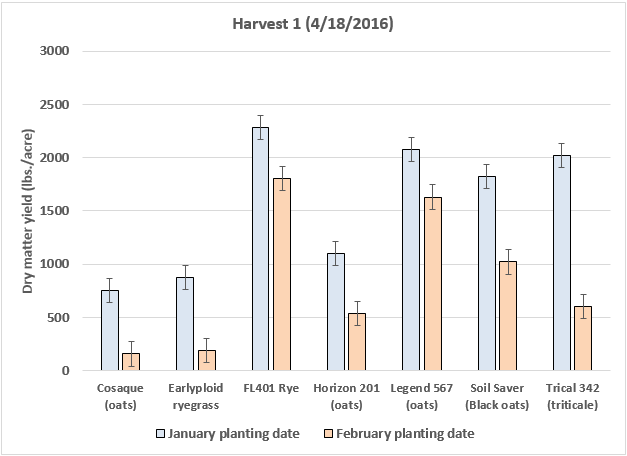 Rye, Legend oats, and the triticale yielded at or above 1 ton of dry matter per acre for the January plantings. The May harvest resulted in less forage being harvested than January for all forage types except for the annual ryegrass, which yielded about 1,200 pounds per acre for the February planting. 1. Continue to strive for planting to be done in the normal fall window. January and February plantings are an emergency fallback option. 2. Preliminary results indicate about 1 ton of dry matter per acre is possible to achieve with January plantings. 3. Livestock producers need to take into account seeding costs and the risk of a hard freeze. 4. If planting oats, make sure they have rust resistance. 5. Cereal rye was one of the highest yielders but might be lower in forage quality. 6. Not a part of this trial, a mix of cereal grain and ryegrass might be another viable option, taking advantage of both early and late seasonal yields.